Theosophia is the synthesis of religion, philosophy and science. This means that the Wisdom-Religion is neither science, nor philosophy or religion, but it contains all these three elements, and forges them together in their highest, most universal aspects. In this issue of Lucifer, the Light-bringer, this is clearly reflected in the article ‘The Wisdom of Love’. This article offers a very interesting view on philosophy. It shows that genuine philosophy cannot do without religion and science. Meditation is usually, and rightly so, regarded as something spiritual. Yet we cannot grasp the idea of it if we do not involve philosophical and scientific elements. This is evident from the article ‘Esoteric Meditation’, of which the first part appeared in Lucifer, the Light-bringer, No. 3, August 2017. The article ‘Developing Concentration’ interconnects well with ‘Esoteric Meditation’, and it also shows that concentration serves our daily life and is necessary for all objectives. The articles ‘Nanotechnology, a closer look inside the world of the cell’ and ‘Why hereditary is so difficult to predict’ seem to be typical scientific articles. But if you approach these subjects from a scientific point of view only, a certain ‘mental lameness’ arises, while if you involve the religious and philosophical thinking faculties as well, you will develop a completely different view on these two important issues. Our articles are not theoretical treatises, but as always we try to demonstrate the practical value of Theosophia. The applicability of Theosophia is also apparent from the answer to a question about current world politics. As always, we welcome your comments, because they encourage us to express Theosophia more clearly. This digital magazine is published a couple of times a year. 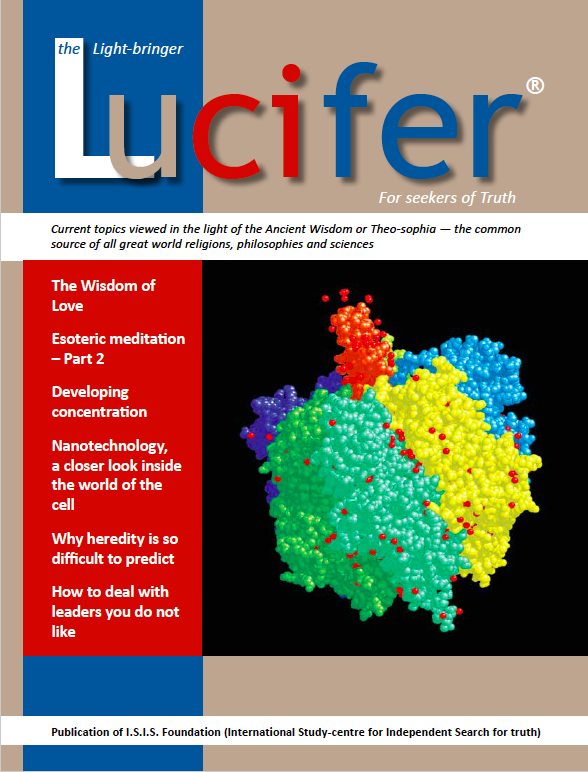 Are you interested in receiving following issues of Lucifer (free of charge), please subscribe here or send an e-mail to lucifer.red[at]isis-foundation.org*.